It is not uncommon to see leaf spots on your hydrangeas during late summer and fall. These spots are caused by a number of fungal diseases. Plant fungi and wet weather go hand-in-hand. 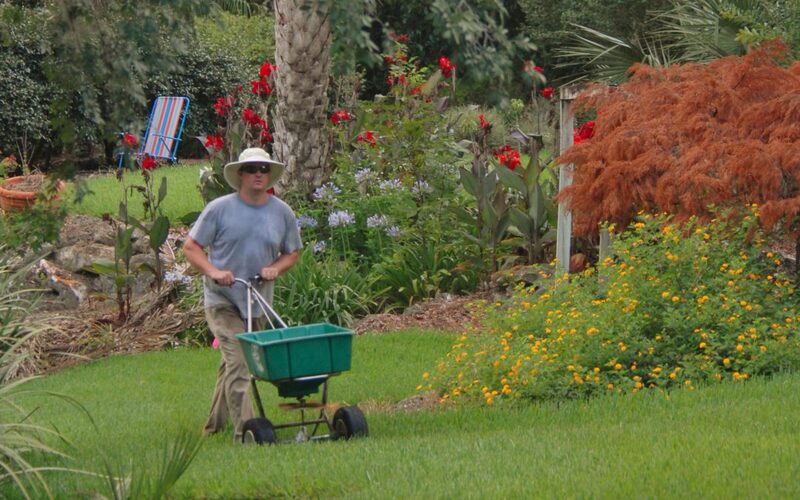 Florida’s high humidity, heavy dews and frequent rains during spring and summer provide perfect conditions to allow fungal diseases to flourish. Bacterial leaf spots can be part of this foliage disease mix, too. Common foliage diseases seen on hydrangeas this time of year include Phyllosticta leaf spot, Target leaf spot, Bacterial leaf spot, Botrytis and Cercospora leaf spot. These foliage diseases are the norm rather than the exception as we move into the wet summer months and on into fall. As a matter of fact, you would be hard-pressed to find any hydrangea in our area without some evidence of infection now. This late in the year it is more of a “grin and bear it” problem. In other words, it’s too late to do much about the fact that your hydrangea plant has leaves covered in ugly spots. By now many of the infected leaves are turning brown, withering and dropping prematurely from the plant. 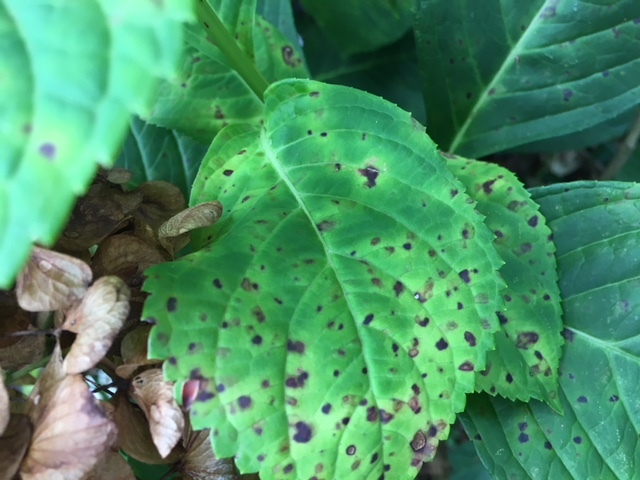 Cercospora leaf spot is one of the most common foliage diseases of hydrangeas. 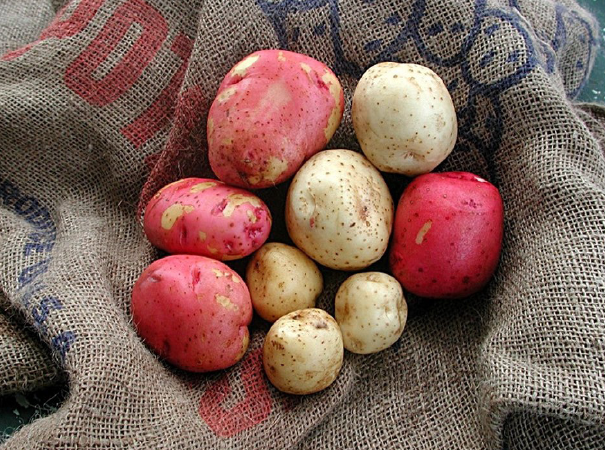 Along with most of the leaf spot diseases, it begins as small dark-colored specks on the leaves. The small specks generally go unnoticed. 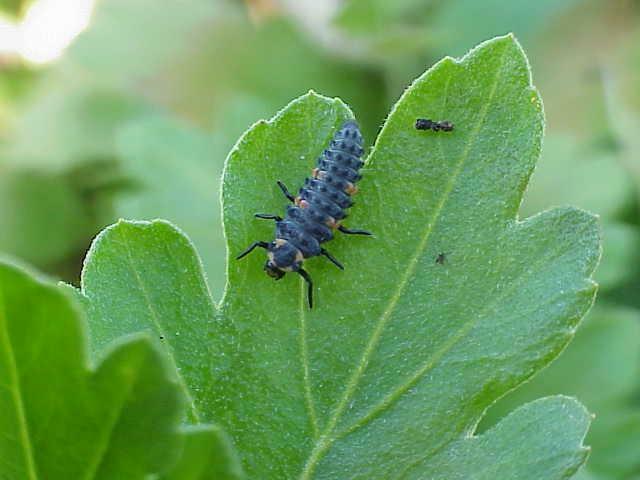 But as the spots continue to slowly enlarge, mostly maintaining a circular shape, they become more obvious. With heavy infection, individual spots can coalesce forming larger irregular shaped brown areas on individual leaves. The individual spots may have a purplish halo with gray center. There are some fungicides that can help prevent these leaf spots. But you’d have to begin treatment early in spring before any leaf spots exist and spray the plant every 10 to 14 days during favorable disease development (humid, rainy weather), which is pretty much our spring and summer months. These types of diseases are prevented, not cured. That’s the “grin and bear it” part of waiting until now. The fungus survives on infected leaves. So, the best thing to do now is to remove and dispose of infected leaves. Also, be careful to not wet the leaves when irrigating the plants during the growing season. New leaves of spring should be spot/disease free as they emerge. But the cycle of life for these leaf spot diseases will again result in spotted/diseased leaves on your hydrangeas next summer and fall without persistent treatment. The good news is that these leaf spot diseases normally do not cause permanent/long-term damage for hydrangeas. They just make the plant look ugly. Camellias are a Panhandle favorite, as the flowers can highlight a landscape with bright, vibrant colors in fall and winter. However, spring time can bring about these colors in a negative way, in the form of leaf gall. The camellia is native to Asia and brought to America in the late 1700’s. These plants have proven to be a dependable addition to the southern landscape with minimal care. 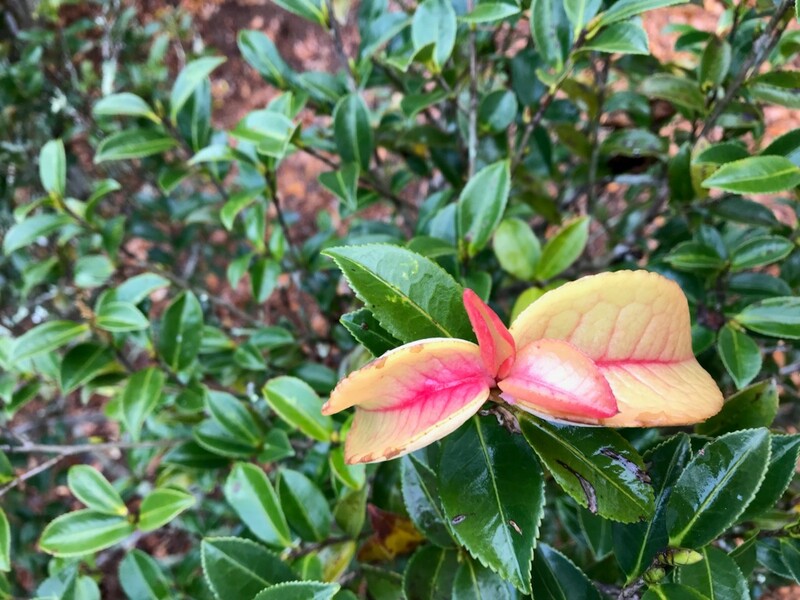 When camellias are correctly planted and cared for, minimal disease problems arise. However, camellias can contract leaf spot, dieback, root rot and bud and leaf gall. Camellia Gall Credit: Patty Dunlap, Gulf County Master Gardener. Leaf and bud galls are caused by the fungus Exobasidium vaccinia. The gall appears as thickened, waxy and enlarged leaves or buds during the cool spring months. One or several leaves on a single shoot may be affected. Once you’ve found infected leaves, no chemical control will be effective. Actually, no fungicide has been found very effective in combatting this condition. However, control can be accomplished in the home garden by simply pinching off and destroying infected leaves. Disease activity usually stops with warmer weather. A best management practice to curb infection is to reduce overhead watering during cool, wet weather periods of spring. Great news, this condition does not cause any long-term issues with the plant. For more information regarding fungal issues in landscape plants, contact your local county extension office.